Deciding what rope to buy for a specific application can be a bit complicated. Only because there are so many different manufacturers, products, and not to mention the vast array of terms associated with rope. Let’s try and simplify this process a bit. For the sake of keeping this short and sweet we’ll narrow it down to one manufacturer, New England Ropes. Then we can talk about what types of rope this manufacturer offers and which ones are ideal for certain applications…. When considering new halyards or reef lines, look for a strong, low stretch line. Halyards and reef lines don’t need to be especially free running with the exception of perhaps the spinnaker gear. Typically halyards want to be low stretch as they need to span long distances under high load. 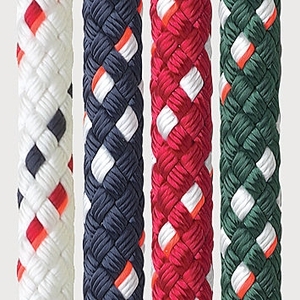 A good choice for most cruising boat halyards is a product called New England Ropes VPC. It has Vectran/ Polyester blended core which provides some of the low stretch we are looking for and is reasonably priced. It also has a nicely braided Polyester cover which provides great protection from sun damage, chafe, and gives you a good ‘grip’. 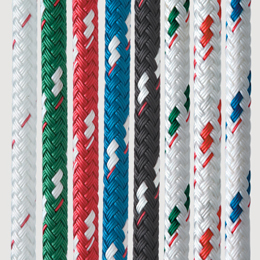 For the spinnaker gear as well as the sheets or anything that requires an especially free running line, we recommend New England Ropes Sta-set. Sta Set is all Polyester, core and cover, which again does exceptionally well with U.V. and chafe resistance, as-well-as it runs freely, and has a nice soft feel. Although Sta-set has more stretch than VPC ( which is actually even preferred for spinnaker gear) it is hardly noticeable in certain applications, i.e. jib sheets. If you are looking for a bit’ more performance you may want to look at New England Ropes Endura (Spectra Core) or V-100 (Vectran Core). These are very low stretch lines and offer the ability to strip the cover off as seen on many racing boats. If you do decide to taper your halyards (or strip the cover) for performance reasons, make sure that they are tapered at the right length. Speaking as a former ‘mast man’, there is nothing worse than ‘bumping’ a halyard and right when you get to the last 3 feet or so (when it is the most difficult), you are trying to grab on to some thin and slippery core fibers. This is an expensive process and should be done properly or not at all. Please note that, especially when choosing a Vectran cored line, striping the cover will give the line a much shorter lifespan. Although a jacket (or coating) is required when exposing Vectran to the sun, the life expectancy of the line we be dramatically reduced. Read more here regarding these fancy fibers and their pluses and minuses. ~With halyards, make sure that the rigger installs reeving eyes, (a.k.a soft eyes, Flemish Eyes, or pull eyes…) on the end of the rope so that the halyards (or any lines that may require special reeving for that matter, i.e. reef lines) can be removed when the boat is not in use. To easily remove your internally run lines for service, make sure that the rigger installs reeving eyes, (a.k.a soft eyes, Flemish Eyes, pull eyes…) on the end of the rope so that the halyards (or any lines that may require special reeving for that matter, i.e. reef lines) can be removed when the boat is not in use. Pro Tip: Using a reeving eye one can remove the lines by tying on a messenger. If leaving lines out of the mast for a prolonged period of time, be sure to use a minimum messenger diameter of 3/16″. This will keep the line from trying to jump the sheave. Removing the lines will allow you to take them home and throw them in the laundry (I’ve even heard of using the dishwasher, less tangle) for the winter. Once washed, dried and de-tangled, it is recommended to coat any exposed core fibers (as found on stripped cover halyards) with a product called Yale MaxiJacket or the like. This will help provide protection from harmful U.V. rays and chafe. If you have never dealt with MaxiJacket before, I would call a local rigger and ask for any tips on applying the coating, it can make quite a mess! Have a question? At The Rigging Company questions are always free of charge. Leave us a comment below. Please email jimmie@theriggingco.com if this is not spam.